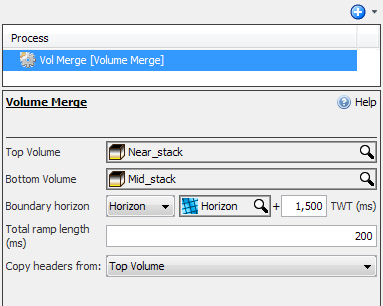 Description Vertically merge two volumes at a boundary defined by a horizon or constant..
Volume Merge vertically combines two volumes at a specified boundary. The process creates an output volume consisting of the Top Volume above the horizon, and the Bottom Volume below the horizon. If a ramp length is specified, the process applies a linear ramp from half the ramp distance above the horizon to half the distance below. Output is skipped for locations where traces are missing from either volume (no interpolation is performed). Note: The two volumes must have the same IL, CL and time/depth extents. 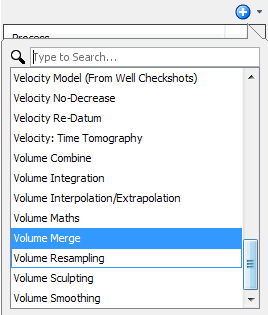 In the Details Panel, select the volume to be used as the top volume in the merging process at Top Volume. Likewise, select the volume to be used as the base volume at Bottom Volume. At Boundary horizon, select to use a Constant or a Horizon to define the boundary at which the top and base volumes will be merged. If a horizon is chosen, you can optionally input a constant to offset the horizon. Type the linear ramp length used in the volume merging process at Total ramp length (ms). At Copy headers from, select either the top or bottom volume's headers to be used in the result. As a result of this process, a new merged volume is available in the Volume tab. Tip: To create input volumes of the same extents so that you can merge them, you can use the Velocity Conversion or Volume Resampling process. To combine multiple disjoint volumes into a single volume, see the Volume Combine process.